At this stage in my life, I know that when it comes to really expensive fine dining, I’m at the mercy of my parents – if they’re treating, I’m eating! That being said, I usually reserve my splurge evenings to special dining experiences when I’m truly treating myself to a classy little meal. SO, when I heard about the 2 prix fixe menu options (meat-free OR meaty-yet-vegetable-focused) that are offered every Monday at the Michelin Starred restaurant Dovetail ($46 for 4 courses), I decided it’s about time to take the trek to the Upper West Side (W 77th St @ Columbus Ave) to get my spoil on. Salsify Soup – creamy, with sweet pearl onions and truffle marshmallows which were SO different; I’m just glad I got to experience them / Winter Tempura – a mélange of lightly fried veggies, served with kimchi and sprouts on a puddle of chai curry sauce (an excellent gourmet take on the traditional vegetable tempura) / Braising Greens Lasagna – a complex layering of flavors that had my brain changing gears every bite – such an uncommon set of flavors; the golden raisins (which I’m not usually a fan of) actually made the dish. My favorite part of the entire meal was a complete surprise – picture a dense chocolate brownie perched on river of thick, gooey caramel topped with mini pretzels and a perfect sphere of BEER ice cream. OMFG. First, this was the best dessert I’ve ever had. Second, where can I find more beer ice cream?! Consider me officially a woman on a mission. 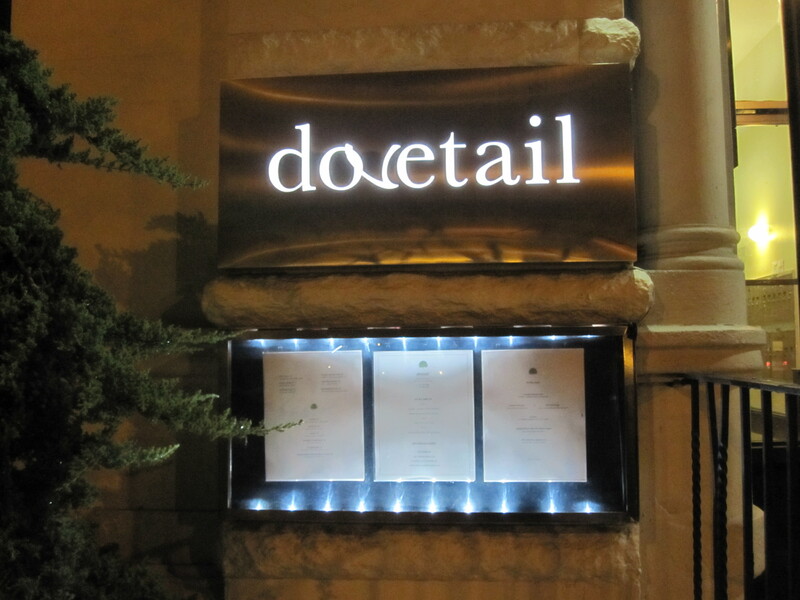 Now if you’re on a mission to treat yourself well, I suggest you head to Dovetail on a Monday evening and try either the vegetarian OR meat-infused, vegetable-focused prix fixe dinner – you know you deserve it! I’ve been dying to try their Meatless Monday menu! From what I understand they have one vegan option in each course. Was that true? I must go! They do have a vegan option in every course (even dessert!) – the Winter Tempura I ate was vegan. It was a very unique and interesting dining experience. Pricey, but the prix fixe is actually reasonable considering the normal menu’s pricing and all the adventurous tasting you get to do!